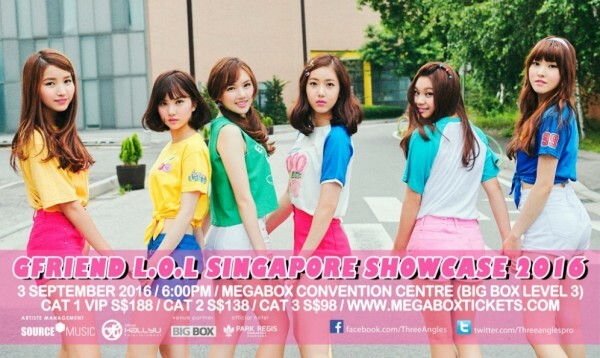 Rising girl group GFriend will be heading to Singapore on 3rd September for their L.O.L Showcase! Organized by Three Angles Production, this showcase will be GFriend's first ever performance in Singapore and it is certainly worth anticipating! The 6-member girl group consists of Kim So Jung, Jung Ye Rin, Eun Ha, Yuju, SinB and Umji. ​Formed under the label Source Music, the sextet skyrocketed to fame quickly immediately after making their debut in January 2015. Their youthful innocence and girl-next-door concept has gained them a steady and loyal fanbase (also officially known as 'Buddy'). With hit songs like 'Glass Bead', 'Me Gustas Tu' and 'Rough' under their belt, it is no surprise that the rookie group has won several titles including the 'Best New Artist' and 'Rookie of the Year' at Melon Music Awards 2015 and Golden Disk Awards 2016 respectively. They continued to achieve success in 2016 with their newly-released first full-length studio album 'L.O.L'​. The title track 'Navillera' has achieved an impressive all-kill and dominated most Korean music charts overnight including Soribada, Melon, Mnet and Naver! Laugh out loud and be guaranteed lots of love from the charming GFriend members at their first ever L.O.L Showcase in Singapore! 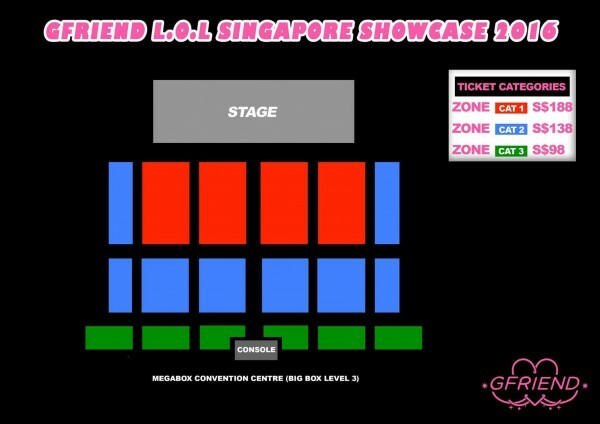 All CAT 1 ticket holders are entitled to an exclusively-made GFriend L.O.L Singapore Showcase 2016 t-shirt as well as a guaranteed opportunity for either a High Touch Pass or a Group Photo Pass with GFriend. As for the other ticket-holders, fret not for privileges have been planned for you as well! 300 lucky fans will be selected to win a rehearsal pass and 100 lucky fans will be picked to win autographed event posters! For more ticketing and event information, visit Three Angles Production's Facebook page. Korea.com's Shya contributed to this report from Singapore.